Our Bible Study today was about the Good Shepherd our Savior. The shepherd walks openly through the entrance and calls each sheep by name. He leads them out to find green pasture and walks ahead of them. The Sheep know His voice and follow him willingly. He gives them a walk with joy and abundance. He lays down His life for them. He knows each one personally. He gives them Life Everlasting. He accepts each one as an individual. He protects them from enemies. Our teacher used her husband as an illustration as she recited the 23rd Psalm. Placing before him a beautiful plate with fruit on it. She lifted the plate and set a round large doily for a table cloth under the plate: “He prepares a table for me.” She anointed his face with oil from Jerusalem, and combed his hair with a small soft brush. 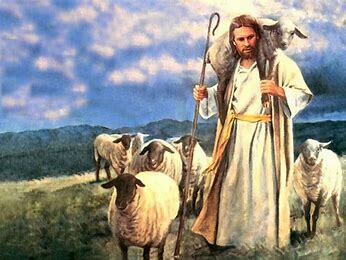 She reminded the sheep that the shepherd was God loving him, caring for him and providing for all his needs; Bringing him fresh living water to drink, including a peaceful place to rest after receiving nourishment. Jesus used sheep and shepherds as examples of God’s love for us. The heart of the Father is to lead, protect and give life, joy, abundance and supply our needs. As events open for us to serve and care for friends, family and others, we can show God’s love. We are called to be like Jesus and to be as a shepherd. We considered the hireling who does not really love the sheep - - it is only a job. There is no relationship - - only duty. As we open ourselves to a personal relationship with our Father God, He offers us gifts of the Holy Spirit to bless others.